Misc. Monday: We Set A Date! I am super excited to officially announce that Dear Fiancé and I have set a date for our wedding! We’ll be eloping at WALT DISNEY WORLD on September 5th, 2016!!! Sorry, lol, I am super excited. Memories Collection: basically an elopement package. This is the cheapest option and includes an hour ceremony and photography, a solo violinist, a limo ride or in-room gift basket, a wedding coordinator, and a bridal bouquet. Escape Collection: standard small wedding package with everything the Memories Collection includes, plus a cake, a reception, and space for more guests. Oh, and far more choices in venues and add-ons, like Mickey and Minnie crashing your reception! Wishes Collection: $$$$$$$$$$$ Basically the sky’s the limit package. Comes with the cartoonish cash register cha-ching sound to remind you how pricy it is. We booked the Memories Collection, and likely won’t be adding on any extras that would jack up the price tag. We want a simple elopement with no frills, but we still want it beautiful. 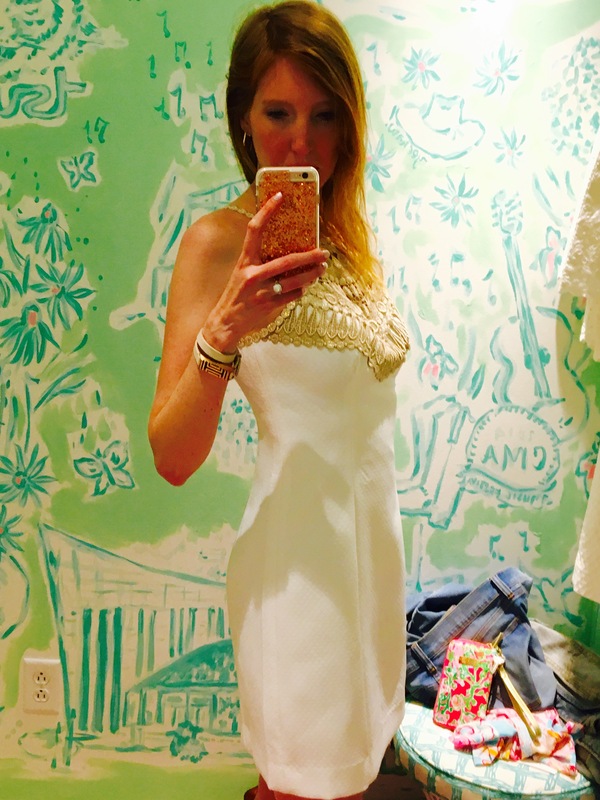 I’m not wearing a traditional wedding dress, just a cute little white shift dress! Dear Fiancé will probably just wear a button up shirt and some nice pants. We bought annual passes to the Most Magical Place on Earth and booked our stay at Disney’s Grand Floridian Resort and Spa. Now we are in the process of choosing an officiant and deciding if I want to spend the money for a hair and makeup artist. I’ll probably just end up doing my own HMU to save money for the vacay. And oh my gosh, I am super excited to be making us matching Disney couples t-shirts to wear to the parks!!! Stay tuned to Toast of Tuesday for my tutorials on DIY mouse ears too. Congratulations Charlotte! A Disney wedding! I don’t think it can get any better. I’m so excited for you. And the dress is gorgeous. I think I like it better than a traditional wedding dress. It’s very elegant and the golden work stands out so well. Looks like something a magical woodland creature would wear to her wedding! And I’m jealous of the elopment. I think it’s beautiful to have just a few people at the wedding, who really really love you! Congrats!! SO excited for you!!! ❤ I love the dress, too. WHEE!!!! This will be so fun! Enjoy. Congratulations Charlotte. This is all very exciting. Wishing you all the beat.